This is the final workout in my beginner kettlebell workout series as Pennsylvania was the last of the 13 original colonies for us to visit. 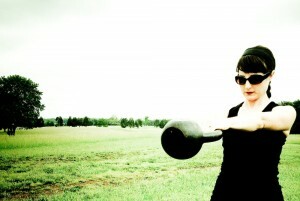 I’ve been dreading editing this kettlebell workout for months. It was our last day in Pennsylvania so I was feeling pressure to get the workout done and I had also woke up on the wrong side of the bed that morning. To top it off, we were having trouble finding a suitable place to workout so we ended up in the parking lot of a little restaurant next to some train tracks. Wouldn’t you know a train would go by during my swings. Of course. I wonder what the passengers thought of the girl swinging the cannonball next to the RV. A girl’s gotta get in her workout, right? In hindsight, it’s kinda funny. In the moment…not so much but I tried to keep a good attitude. That’s not to say Lancaster County, Pennsylvania wasn’t wonderful. We hadn’t planned on going there but it’s where a family RV rally was being held. We were all glad we went because it’s the heart of Amish country which was fascinating to experience even if it was on a superficial level. (It kinda makes me want to simplify even more.) We took an Amish buggy ride and found lots good food. It’s hard to tell in the video but it’s a GORGEOUS landscape of rolling green hills dotted with small farms. I called this kettlebell workout “Begin with the End in Mind” for a few reasons. First, as I said it’s the last final workout in my beginner workout series. Woohoo! Secondly, when I teach Turkish Get Ups I like to start by breaking it up into the beginning and the end. This workout practices the end of the Turkish Get Up. (That is if you don’t count going back down into the starting position.) If you are brand new to Turkish Get Ups I suggest practicing them without weight until you feel comfortable with movement and using a lighter weight (and balancing your shoe on your hand) while you practice the different sections separately. Thirdly, whenever I start something I like to visualize (and pray for) the outcome. Before we headed out on our trip I saw, in my mind’s eye, my family growing closer as we traveled. I think that ha contributed to our success so far. Four people and four animals living together in a small space could have easily ended up a disaster. When I started working out I also visualized how I would feel, goals I would accomplish, and the way I would look. That helped me (and still does) to keep and get back on track when my healthy habits start to slip. 12 reps (6 on each side). Do these in whatever way feels comfortable. In other words, alternate sides, by twos, or threes. It’s 12 total. 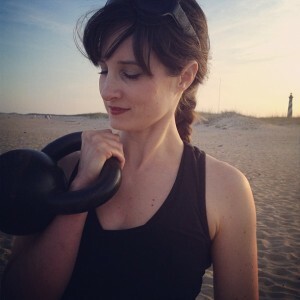 I don’t have a problem with the kettlebell workout itself but my oh my…those swings! I look like I’m falling asleep and where’s my hip hinge? I admit I tend to get lazy with swings because it takes work to do a good swing but this is a perfect example of how our mood can really effect our workout. All that to say, make sure you hinge (load) your hips (and keep your shoulders down and back) while you swing! Have you ever been to Amish Country? Anyone else love the idea of simplifying life? Anyone else have trouble working out when your in a bad mood? What kind of beginner kettlebell workouts do you like? HIlarious on the train! And that was a tourist train too- not like an amtrak or something! ugh. Well if it makes you feel any better, when we were in Iceland on a 1200 miles road trip, my “workouts” were about 20 minutes of lunges & squats at rest stops in the middle of nowhere and wouldn’t you know that a tour bus passed by during my sumo squats. Yah, fun.